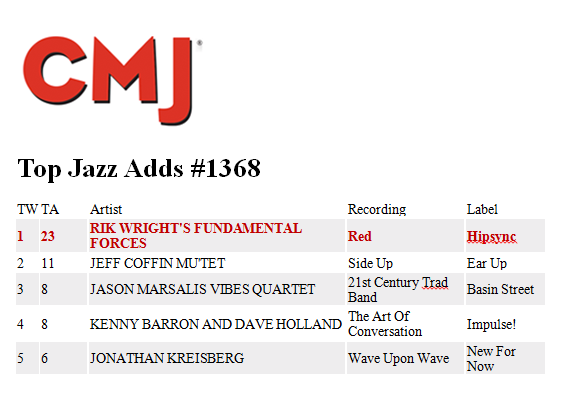 We’re the #1 CMJ Radio add this week! Yeah, that’s right… we’re the #1 CMJ Radio add this week, again! So what the hell does that mean? In the most simplest terms, it means that the program directors at these radio stations have agreed to put our CD on their play list. It’s different from the “spin” chart, which is how often stations are playing it. That comes next. To that regard, with Blue we hit #21 on the CMJ “spin” charts, and stayed on the chart for 6 weeks. CMJ is an organization that aggregates play lists from college, community and NPR stations, i.e., where most jazz is played. For any week, a CMJ station will determine which were the “top 30″ tracks to get the most airplay during that seven-day span. These Top 30 charts then go to CMJ for determining the overall Top 200. That means earlier this year, our debut CD Blue was the #21 most played recording on these stations. This entry was posted in Musings, Promotions on November 9, 2014 by Sunrise Pixels.